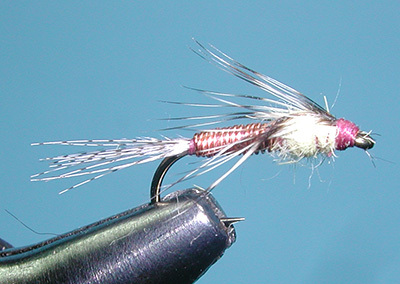 Notes: The Wonder Nymph is a pattern created by Brad Downey, owner of Angler's Edge in Fort Smith, Montana. Brad has been guiding on the Big Horn since 1983 and emerging PMD's, as well as Baetis, have been an important pattern on this river system. The Wonder Nymph is unique by the construction of the wingcase which represents both emerging wings and legs. 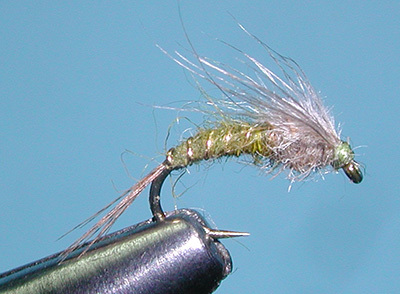 The base of the Hen Hackle has a very fluffy section that is often discarded when the hackle is used for wet flies. Brad utilized this section by securing the quill section to the hook shank at the base of the thorax and pulling the fluffy section over the thorax as you would do with a flashabou strip on a flashback. Some variations actually do use a piece of flash to do this as well. The wingcase has a bat wing profile when completed. The pattern was designed to fish within the film utilizing a light wire hook. To keep the pattern within the film, it is recommended to use a powder floatant, rather than a paste that would mat down the feather fibers. 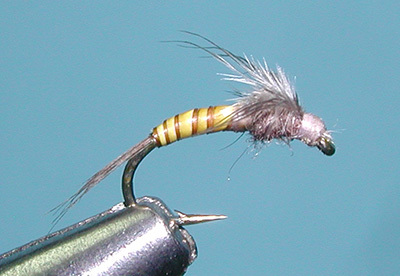 However, this is a versatile pattern that can also be fished deep as a typical nymph with an indicator and weight on the leader. It can also represent a dun that is just emerging from it's shuck. There are a number a number of variations of this pattern depending on how the pattern is fished. 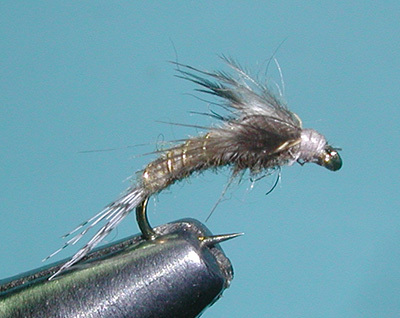 Charlie Craven came up with his version utilizing a biot body similar to a biot emerger midge pattern. 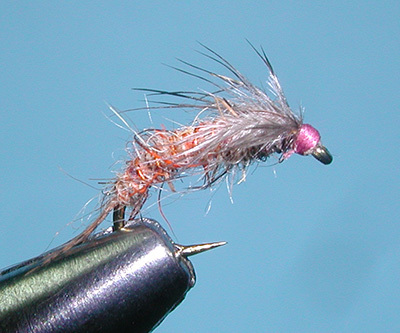 There is even a John Barr variation utilizing a copper wire body to give the pattern the weight necessary to reach deeper sections of the water column. You can change the coloration of the hareline dubbed body and size of the hook to fish Baetis and Calibaetis hatches.